FILE- Arizona Republican Senator John McCain, center, endorses the Trans-Pacific Partnership. Republican Senator John McCain stood out among lawmakers by immediately and enthusiastically endorsing the pact. "The TPP offers a historic opportunity to reduce trade barriers, open new markets, promote made in America exports, and keep American companies competitive in one of the most economically vibrant and fastest-growing regions in the world," McCain said in a statement. McCain and Sanders are exceptions to a wait-and-see approach that currently prevails on Capitol Hill. Many lawmakers approached by VOA said they needed time to read the accord and digest its provisions. 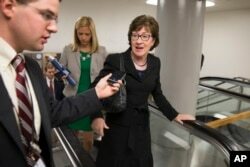 FILE - Sen. Susan Collins, R-Maine. Even so, senators who are generally supportive of freer trade are voicing apprehensions about TPP’s impact on the states they represent. “I think it’s a good idea for us to export the things we grow and make to other parts of the world,” said Republican John Cornyn of Texas. 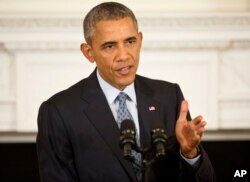 President Barack Obama gestures as he answers question from members of the media during a news conference. President Barack Obama said Tuesday he expects resistance to the pact on Capitol Hill, but is confident TPP’s benefits will win the argument. Getting TPP to the president’s desk will require approval in both houses of Congress as lawmakers gear up for next year’s elections. Earlier this year, many Democrats and a few Republicans opposed Trade Promotion Authority, or TPA, also known as “fast track,” which subjects trade pacts to simple majority votes with no amendments allowed. TPA ultimately was approved, but foreshadowed a bruising legislative battle over the Trans-Pacific Partnership. Republican Orrin Hatch, who helped shepherd TPA through the Senate, said TPP cannot survive many defections by lawmakers who support the accord in concept but object to some of its provisions.